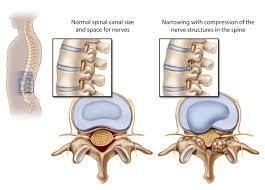 Spinal stenosis is narrowing of the spinal canal, which contains the spinal cord and emerging nerve roots. This condition most commonly affects the neck (cervical spine) and or the low back (lumbar spine). Typically, stenosis occurs due to age related degeneration or ‘wear and tear’ of the spine. Less commonly people are born with narrow spinal canals and will experience symptoms at an earlier age. Sometimes there are no symptoms with stenosis where as other times there can be a variety of symptoms, some including pain, stiffness and pins and needles into the arm or hand. Stenosis is classified by the area in which the narrowing has taken place. There are three different types of stenosis; central, foraminal, and far lateral. Central stenosis is when the spinal canal that holds the spinal cord becomes narrowed or blocked. This can occur due to a bulging or prolapsed disc, thickened ligament, a slipped vertebrae and bone spurs or growths commonly associated with arthritis. Less commonly this blockage could be due to a spinal tumour. Foraminal stenosis is the most common and affects the nerve as it branches off the spinal cord and passes through a small hole called the neuro-foramen. This type of stenosis may also be referred to lateral stenosis. In most cases this narrowing or blockage is caused by osteophytes (bone spurs) that develop due to degenerative changes such as a degenerated disc or facet joint. As the nerve passes through the small passage the bony spur pushes into the nerve causing it to pinch. Additionally, this blockage may be caused by other factors such as a bulging or herniated disc, facet joint or thickened ligaments. Far lateral stenosis occurs outside of the neuro-foramen, as the nerve exits the spine. Similarly to foraminal stenosis, the narrowing or blockage or the nerve is caused by bonespurs, thickened ligaments or a bulging or herniated disc. In many cases foraminal and far lateral stenosis occur simultaneously. Stenosis is caused by a variety of things. It can be congenital (genetic) or acquired from other diseases such as arthritis (most common), cancer, tumours, bone disease or trauma. In normal cases, the spinal cord travels from the brain to the bottom of the spine through the spinal canal and has nerves branching off. The spinal canal is formed by each vertebra, which contain a hole in the back, that are stacked on top of each other forming a long canal. This canal protects the spinal cord as it travels down the spine.There are several things that can lead to the spinal cord or nerves branching off the spinal cord to become constricted. These include, bone spurs, swelling or inflammation of surrounding soft tissue, bulging or herniated discs, misaligned vertebrae, spinal ligaments, and least commonly, a tumour. Symptoms depend on where the stenosis has occurred and how much the nerve is being compressed. However, the common symptoms of cervical stenosis typically include, neck and arm pain, stiffness, numbness, and pins and needles. In more severe cases, there may also be arm and hand weakness and if the spinal cord is being compressed there may also be reduced reflexes and a loss of fine motor skills. Treatment for cervical stenosis depends on symptoms and may include a variety of things. For a start your GP may prescribe anti-inflammatories and pain killers and depending on severity may refer you for an MRI or a corticosteroid injection. Your Physiotherapist may use techniques such as mobilisations, massage, dry needling and exercise to help reduce pain and muscle tightness and to increase your mobility and function. In more severe cases your Physio and GP may initially try conservative management and if this doesn’t work then they may recommend surgery. At this stage your surgeon will either do a decompression surgery to increase space in the area ofthe spine that is narrowed or in more severe cases, stabilisation surgery, where they remove the area that is affected.